Lake District holiday June 2014 - The eastern fells. After the dreadful weather we had on our last visit, this time was the total opposite with the temperatures regularly in the mid 20's. The start point on this trip was Rydal Hall campsite near to the popular town of Ambleside with some great fells to climb all covered by Wainrights book number 1 the eastern fells. The campsite was of excellent quality providing all that you need, and it was on the popular path that leads to the Fairfield Horseshoe the main purpose of our trip up there. After we set up camp we visited the local Ale house, the Badger bar at Rydal just half a mile from the tent to try the local brews and taste some of the best food we have had in a pub in Cumbria, The Old man Ale brewed by the Coniston Brewing company was the best by far, however O.S.B Headmaster come a close second. Well as you can see it was hard work drinking all that beer but we needed it big time for we had 3 full on walks to do through some of the best lakeland Fells Cumbria could offer. The only bad point was the constant midge attacks that started around 07.30pm at night iIhave never been bit as much in all my life, however we put up with it, please click on one of the the walks below to view the route and information that you require. 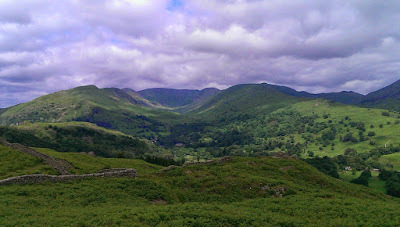 10.3mile with 3424ft of ascent - 8 wainwrights climbed.